A City Suburban Service Inc. 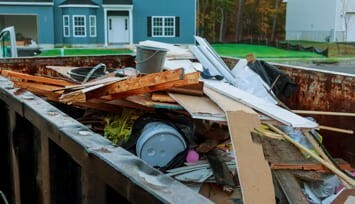 Ten cubic yard dumpsters can accommodate debris from small residential cleanup and renovation projects, such as, kitchen or bath remodel, to minor commercial renovation projects. Set your worries aside and let A City Suburban team take care of your trash fast. All you need to do is to comply with the restriction on the items that you can throw in the dumpster. Let us take care of your trash in Chicago and surrounding suburbs. How big is a 10 yard dumpster? 10 yard dumpsters are 14 feet long, 6 feet wide and 3.5 feet tall and can hold about 3 to 5 pickup truck loads of trash.Ten cubic yard containers can hold up to 2.5 tons of waste, including dirt, cinder blocks, asphalt and similar materials. What may fit in a 10 yard dumpster? 10 cubic yard dumpster is a great choice for those who need to throw out dirt, sand, sod, rocks, cinder blocks, concrete or bricks. Previously mentioned materials are only allowed in 6 and 10 yard dumpsters. On the other hand, hazardous materials are not accepted. 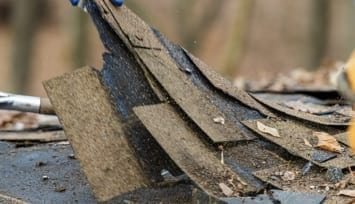 For example, you can not throw medical waste, lead acid batteries, industrial waste, asbestos, solid waste, tires, paint, oil, and flat roofing in a 10 yard container. What are 10 yard dumpster rental prices? You can rent a 10 yard dumpster for $310. Free dumpster delivery and pick-up are guaranteed. 5 days dumpster usage are included in the base price. 10 yard roll off dumpster will have 2.5 tons of disposal. Household waste and construction debris can be put in the container without any additional costs. If you want to get rid of concrete, you’ll need to add $20. The good news is that this type of waste does not have a weight limit. You can also throw out bricks and dirt for additional $50. Bricks do not have a weight limit as well. Great company! Dumpster cost us less than other 3 we called, service was exceptional! Dumpster was delivered the next day and picked up within hours after we were done with it. Excellent! How to rent a 10 yard roll off dumpster? You can rent a 10 yard dumpster by simply filling out the online form. Another way is to call A City Suburban team at 773-295-0303. By making a call, you will be able to rent a dumpster the very same day. If you are not sure which dumpster size fits your needs best or have any other questions, feel free to contact us. Do I need a permit for a 10 yard dumpster? You will only need a permit if you are going to place a 10 yard dumpster on public property, street or sidewalk. In order to find out whether your city requires a permit for dumpster rental, you can always check the city’s local requirements. Online ordering is a fast and simple way to rent a 10 yard dumpster. All you need to do is to fill out an online form and provide all of the required information. You can also receive a free quote in less than an hour that will count the price for your individual case. Not sure what dumpster size you need? Why rent a dumpster with us? Same day dumpster delivery and pickup at NO EXTRA CHARGE. Our rental prices are up to 20% lower than our major competitors. We have 6, 10, 15, 20, 30 yard dumpsters available to fit any project. Our experienced staff ensures rental process to be smooth and detail oriented. I requested late night for same day delivery Mr. Zilvinas Jancoras contact me early in the morning and help me get a right size dumpster on same day morning and pick up next day early morning as I requested. It was one of the best customer service I ever had. Was got me a really great price. I really appreciate all the support. Great customer service! I called a dozen other places and this was the best choice. Friendly, cheap and reliable. Helpful and friendly dispatch work. Fast delivery. Reasonable price. My recommendation. Dumpster rental is easy at City Suburban Service Inc.: simple process of choosing, delivering and picking up a roll off dumpster makes it hassle free. Our roll off dumpster sizes vary from 6 to 30 yards to suit all of your needs. We even provide same day dumpster rental. With a simple telephone call our roll off dumpsters can be delivered and picked up in Chicago land and suburbs, including: Berwyn, Bolingbrook, Blue Island, Bloomingdale, Brookfield, Burbank, Calumet City, Carol Stream , Chicago Heights, Cicero, Crest Hill, Darien, Des Plaines, Dolton, Downers Grove, Elk Grove Village, Elmhurst, Frankfort, Frankfort Square, Gooding Grove, Harvey, Hickory Hills, Homewood, Joliet, La Grange, Lemont, Lincolnwood, Lisle, Lockport, Lombard, Matteson, Maywood, Melrose Park, Midlothian, Mokena, Morton Grove, New Lenox, Naperville, Oak Brook Oak Forest, Oak Lawn, Oak Park, Orland Park, Palos Heights, Park Ridge, Plainfield, Romeoville, Roselle, Schaumburg, Stickney, Tinley Park, Warrenville, Westchester, Wheaton, Woodridge and other surrounding cities. Contact us for reliable, efficient and professional dumpster rental service. Contact us for immediate delivery. Check your Zip. 5 digits required. Anytime 7 am - 5 pm 7 am - 8 am 8 am - 9 am 9 am - 10 am 10 am - 11 am 11 am - 12 pm 12 pm - 1 pm 1 pm - 2 pm 2 pm - 3 pm 3 pm - 4 pm 4 pm - 5 pm Please select time. When Text withuot URL required. ZIP Please check your ZIP code. What do you need to put into a dumpster? Enter your ZIP code below to check is it available in your area. Contact us and get your dumpster now! Containers must be filled level full, nothing over the top. Customer will be charged $55.00/Ton for any overweight. The following waste/debris is NOT accepted in City Suburban Inc. dumpsters: Hazardous materials, medical waste, lead acid batteries, industrial waste, asbestos, solid waste, tires, paint, oil, electronics, matrasses. Dirt, sand, sod, rocks, cinder blocks, concrete, bricks, flat roofing are ONLY allowed in 6 and 10 cubic yard dumpsters. The customer agrees to be charged automatically on their credit card for above mentioned items. Customer agrees to indemnify, defend and hold harmless A City Suburban Service, including its officers, directors, members, employees, agents, affiliates, subsidiaries, successors and assigns from and against any and all claims, counterclaims, suits, demands, actions, causes of action, damages, setoffs, liens, attachments, judgments, debts, fines, penalties, charges, expenses, costs or other liabilities of whatsoever kind or nature (collectively, “Losses”) asserted or alleged by any third-party arising from or related to: (a) Overload Expenses; (b) Customer’s failure to obtain and/or maintain any required Permit; (c) Customer’s use or storage of Prohibited Substances in the Equipment; (d) loss or theft of the Equipment; (e) damage and/or destruction of the Equipment during the applicable rental term; (f) personal injury and/or property damage relating to Customer’s use and/or possession of the Equipment; (g) physical damage to streets, roadways and/or driveways caused by the Equipment; and (h) Customer’s breach of the these terms and conditions or the terms of any of the Rental Documents.